In a follow-up report on the measles outbreak in the Dublin and Meath areas of Ireland, 22 confirmed measles cases have been reported since the first two cases were reported in October. Most cases have occurred in the Dublin area (n=13) and nine in the North East (Meath (n=6), Cavan (n=1), Louth (n=2). Most cases were not vaccinated (n=13); 5 cases had received one dose of MMR, and vaccination status was not known for the remainder (4 cases); 17 of the 22 cases were aged 12 months or older, and therefore age eligible for vaccination. Of these, 5 were vaccinated with one dose of MMR, but only one of these cases was age appropriately vaccinated. No new cases have been confirmed in the Dublin area since mid-November. But it is too early to state if the measles outbreak in the Dublin area is under control as two incubation periods (42 days needed after last case notified) must pass without any further cases identified to determine that. The outbreak in the North East is still active although just one case has been confirmed each week for the most recent four weeks. All children should be age appropriately vaccinated (dose 1 at 12 months and dose 2 at 4-5 years of age) Parents who are not sure of their child’s vaccination status, should speak with their GP about availing of MMR vaccination if in doubt. 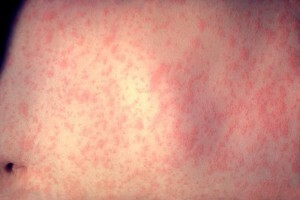 Children between the ages of 6-11 months, if travelling out of Ireland to countries where measles outbreaks are occurring should seek early MMR vaccination before travel to prevent measles. This early dose does not replace the doses that are required at or after 12 months of age and at 4-5 years of age. Teenagers and adults who have never had measles or two doses of MMR should speak with their GP to obtain vaccination. The vaccine is free. All new health care workers are required to have two documented doses of MMR prior to commencing work. Continued high levels of vigilance are needed and clinicians are asked to notify immediately any suspect cases and to take diagnostic samples to confirm or out-rule measles in all patients in whom measles is suspected. Hey – Where did you get this data from: “Most cases have occurred in the Dublin area (n=13) and nine in the North East (Meath (n=6), Cavan (n=1), Louth (n=2).”? I can’t find a secondary article/source about this.